Midcentury design represented such an explosion in style after the restraint of the Second World War. 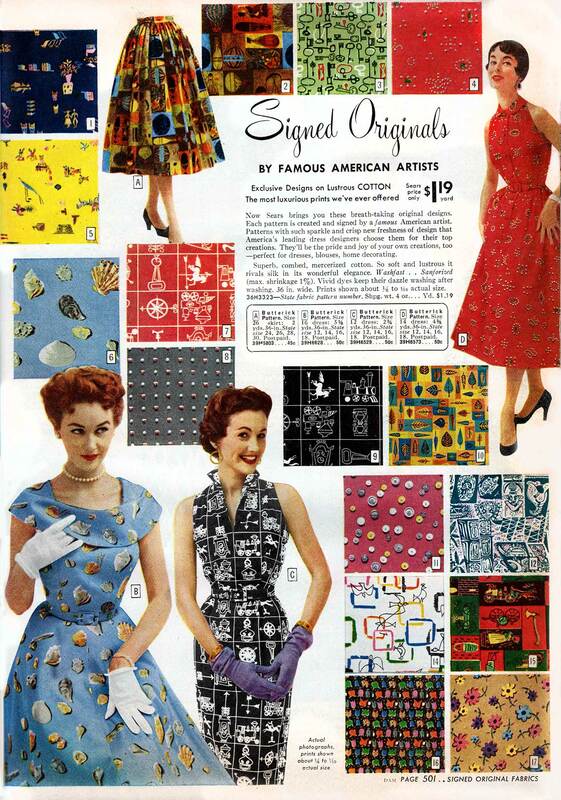 This 1954 Sears catalog offers a textbook in a single page of fabrics. Buttons, birds, shells, leaves, flowers, keys, balloons, even tribal masks, fire trucks, and locomotives(!) — you might expect to see these spirited patterns on furniture or drapes, but here they are draped on slender models. Butterick dress patterns were available for purchase so you could sew the exact outfit as seen on this page. For at least a moment, Sears could be seen as a tastemaker. They even juried a fabrics exhibition at New York’s Museum of Modern Art in 1956! What they apparently forgot to do, curiously, is identify any of those famous American artists who designed these fabrics. Perhaps the artists weren’t as famous as we might want. It would have been nice to give them credit, but the designs themselves are so strong you could probably reprint them today to brisk sales.